Did I tell you that my parents love travelling? When we, my brother and me, were kids, we used to go on at least two vacations every year; the summer one used to be at least two weeks long dedicated to exploring far flung parts of north, west or south India; while the winter ones, much shorter, about five day long, were for near by destinations. We used to travel by the Indian Railways and planning and preparations for the travel would start months ahead. Ah the excitement of going on a holiday. We never went back to the same place, we did not need to, there is so much to explore and see in India. But some places we would pass through every year or so. One such place was the railway station of Mughalsarai in the Indian state of Uttar Pradesh. I have passed through Mughalsarai station numerous times, but never ventured into the town itself. If you are travelling from Bengal which is in the east of India northwards on the train, you would pass Mughalsarai Junction invariably. Now most trains halted there since it'a a big junction, a few like Rajdhani Express did not. When the trains did, my dad would get down from the train to the platform and go in search of fresh drinking water to fill up our water bottles. Once that was taken care of next came the quest for food. Now Mughalsarai may be famous for other stuff as well but for us it is/was ubiquitous with hot pooris. We knew come Mughalsarai, a big and bustling junction where trains from various far flung parts of India criss crossed each other and passengers jostled to get on the right train also produced some of the yummiest pooris I have ever eaten in my life. In case you are wondering what pooris are, they are the North Indian variety of the Indian fried bread, these are made with whole wheat flour, sometimes they are flavoured with spices like asafoetida or have a stuffing of urad daal or green peas but the ones found on railway platforms were usually the simple, no fuss kind. 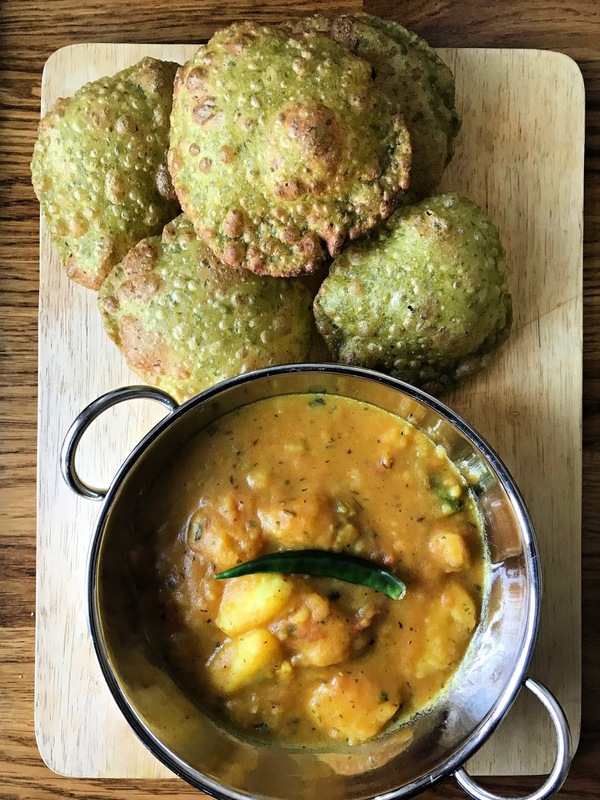 They are/were generally served with a water-y potato curry, where the cubes of potatoes are boiled so much that they break up into smaller pieces and the starch of the potato thickens the gravy up. This curry is usually called the aloo ki sabji which means potato curry or aloo rasa, aloo= potato, rasa= gravy. In the 90s food in the Indian railway stations used to be local and fresh. There were not many choices, but what you found would be good quality food at very reasonable prices. Like the stations in North India generally served poori sabji, while in the South India you would find dosa, idli, sambar chutney etc. If you went searching for idli sambar in Mughlasarai in the 90s, I doubt you would have found it. All the food were cooked fresh that very day or were being cooked while you were being served. These eateries served millions of regular Indians travelling on the railways, and on the whole the food was pretty safe to eat. And delicious to boot. This was way before all the toxic giant international food chains hit the Indian market and thanks to relentless and clever marketing took over the food scene. Now a days apparently freshly cooked railway food is becoming a thing of the past, you order food from your favourite junk place online and at the next station the garma garam junk is ready to be delivered in the comforts of your train compartment. I find it really depressing when flourishing local systems are dissolved to make way for the multinationals but I guess tastes have changed and the youth of today prefer burgers to pooris. Back in the days there would be these mobile food carts where the vendor would expertly fry big batches of fresh pooris and when a long distance train stopped people would crowd around him. It was a tricky situation, while waiting for your food, you have to keep your ear open to listen to the train's whistle. Under no circumstances should you miss the train. I remember as a kid I used to be terrified whenever my father got down at the stations and would wait with bated breath till he was safely back in the compartment. He would be clutching four thongas for the four of us in his hands. Each thonga/a rustic bag of sorts made with dried shaal leaves (shores robusta) would have 3 to 4 freshly fried pooris with a ladle of steaming hot sabji heaped rather unceremoniously on top of the pooris. Now this sabji used to be so steaming hot, you could hardly taste any of it while the pooris would be oily and slightly stretchy. But together, pieces of pooris dunked in that gravy tasted delicious. The sabji tasted faintly of spices and tomatoes but everything was so mashed up together and the gravy so hot as a kid I never figured out the predominant taste. Once you were done you just chucked the biodegradable bag and the cows either ate those or they disintegrated into the earth. Years have passed and I no longer travel much on the Indian railways. But I do miss the railway food, specially the poori sabji. In desperation I tried replicating the aloo sabji/rasa in my London kitchen and I am glad to report that it had turned out pretty good. In fact finger licking good, if I may say so. This recipe, dear reader is as much for you as it is for me to remember and recreate in my kitchen anytime I have the craving. Remember it's a rustic dish and does not require much finesse, read everything roughly peeled and chopped and thrown together. But that does not compromise on the taste, rather enhances it. 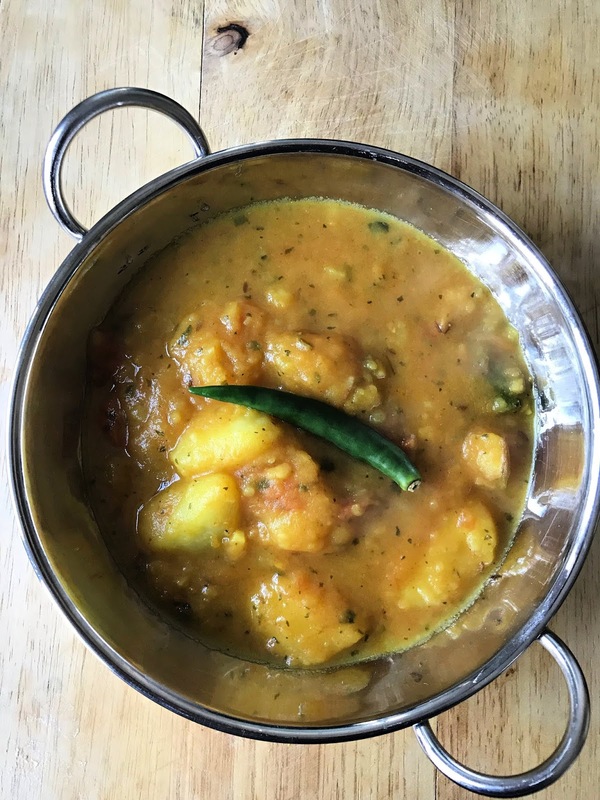 Cook's Notes: This aloo ki sabji or aloo rasa or potato curry is a blast from the past. I have been experimenting with this in my kitchen and finally I have nailed it to my satisfaction. This curry belongs to the Eastern Uttar Pradesh style of cooking where they do hing aur jeera ka chauka or in other words temper their curries with asafoetida and cumin seeds. This curry has a strong smell and flavour of asafoetida, if you are not used to that smell, go slow on that spice. I know some people omit it altogether, which is a great shame, I feel. Other than that the other flavours jostling for your attention are the tomatoes which makes the curry slightly tangy, ginger which brings in a slight heat, green chillies which make the curry spicy and brings in a fresh flavour, and of course the soothing flavour of cooked cumin and fennel seeds when you bite into these spices along with the potatoes.